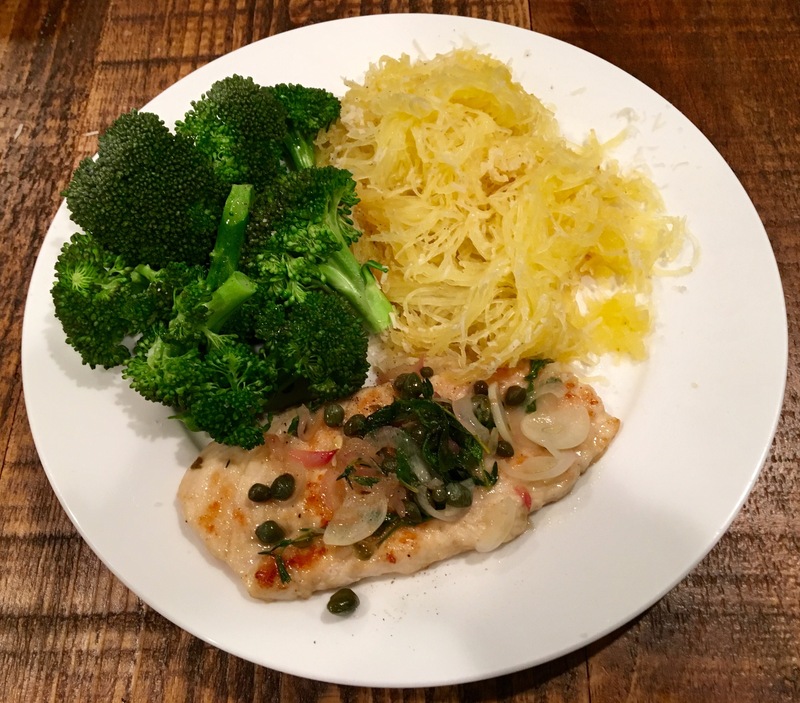 Presenting Wednesday night’s dinner: steamed broccoli, roasted spaghetti squash with butter & Parmesan, and lemon caper chicken. I’m exhausted, so this post will be short, but I had to post because I made this dinner totally on the fly and every component was perfect, note for note. Also- 8 SmartPoints! Chicken: split a breast into two cutlets. Dust with flour, salt and pepper. Brown both sides in a non-stick pan over medium heat, then remove chicken. Add 2 tsp EVOO to pan, then 2 cloves thinly sliced garlic, one small thinly sliced shallot, 2 tbsp capers and their brine, and the juice of 3/4 lemon. Cooking 3 minutes, stirring so garlic doesn’t burn, then toss chicken in the sauce and cook for another minute. Broccoli: steamed in microwave for 3 minutes, topped with the juice of that last 1/4 lemon and sea salt.